The goal of most marketing teams is to drive conversions. Often, this comes in the form of lead generation, but in the world of customer success, marketing looks a little different. As marketers in customer success, our major goal is to convert customers into evangelists. 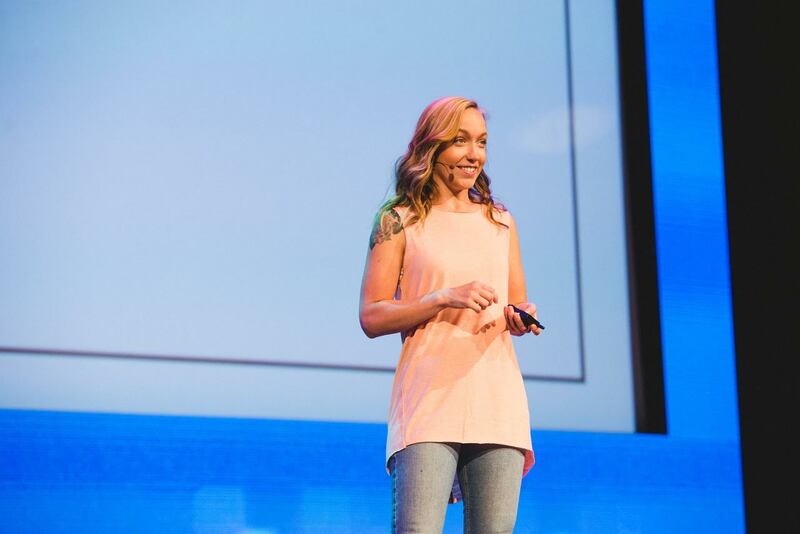 At Unbounce, I work on a customer marketing team dedicated to doing just that. We build campaigns to make our customers happy, so they shout from the rooftops -- or their laptops -- about how much they love our product. One of the ways we measure customer happiness is through annual recurring revenue from new annual plan sign-ups. The more customers we have signed up for annual plans, the higher our customer happiness metric ticks upwards. Here's the story of how our team developed three principles of customer happiness that served as the foundation for a recent customer marketing campaign to drive annual plan sign-ups, and how these principles helped us drive over $600,000 in annual recurring revenue as a result. Part of working at Unbounce means we spend a lot of time on self-directed professional development. Like, twice-a-month-a-full-Friday-dedicated-to-professional-development kind of a lot. On one rainy Friday here in Vancouver, Canada, I read the Harvard Business Review (HBR) Emotional Intelligence Collection. The theme of the collection is to help humans understand the role of emotions in professional development and well-being at work. I launched into their volume on "Happiness" simply to understand more about how I can be more emotionally intelligent in my own work... and emerged with an entirely new outlook on customer happiness. An unfocused human is an unhappy one. In his article "The Future of Happiness Research," Matt Killingsworth explains: "No matter what people are doing, they are much less happy when their minds are wandering than when their minds are focused." Unfortunately for us, we live in a world of noise, where distractions are plenty and the average attention span decreases year over year. Every day at Unbounce, I'm often multitasking between various Slack channels, 20 different chrome tabs, doing my job and mentally reciting to myself not to get up and see what new delicious-yet-wildly-unhealthy treat my evil co-worker has dropped in the kitchen for all to enjoy. Our customers -- and yours too -- are likely experiencing similar situations every day. Which is why a little focus in your marketing helps to grab attention and improve happiness. 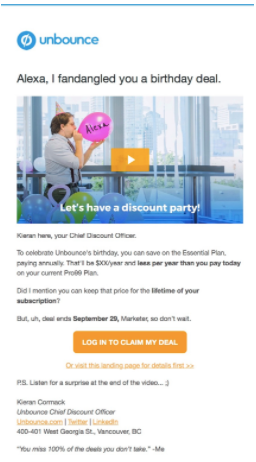 1) We created one focused objective for our customers to achieve: Log in to Unbounce and claim their deal on an annual plan. This may sound straightforward, but before this campaign, we had never collaborated across customer marketing and product to make this section of our app linkable. In fact, we used to avoid collaboration, for fear that external dependencies would slow us down (sound familiar?). 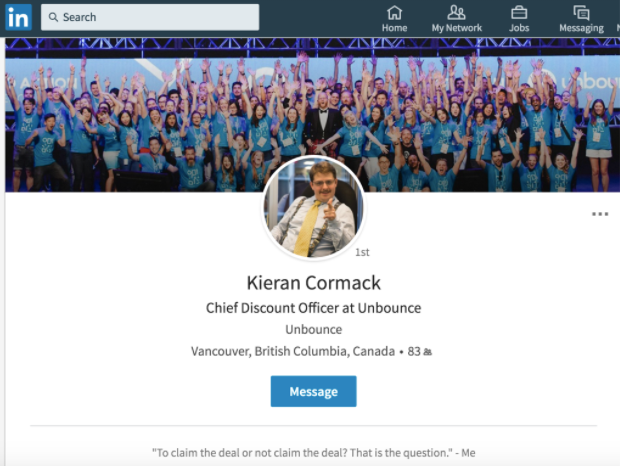 But with the principle of focus guiding us, we made cross-department collaboration and removing barriers to this section of Unbounce a top priority. 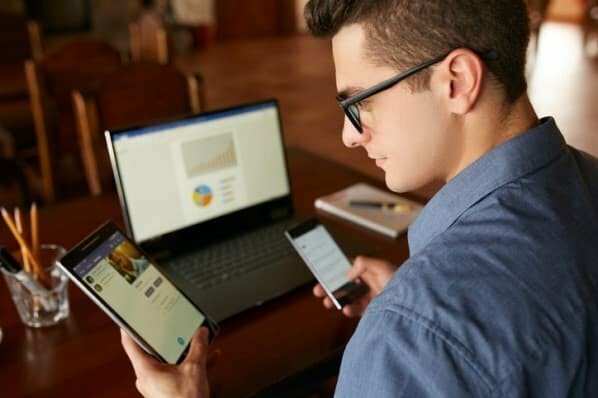 Now, we always think of how we can make both the pre- and post-click experience more enjoyable for customers -- and how we can work with the product team to make it happen. 2) We implemented the principle of focus through hyper-personalized messaging. We used URL parameters and an Unbounce feature called Dynamic Text Replacement to build dynamic URLs that pulled personalization tokens from our customer relationship management (CRM) platform into our emails and all the way through to the campaign landing page. We then personalized the image thumbnail of our campaign video. Like our VP of Product Marketing, Ryan Engley, points out in this recent article he wrote for Wistia, "there's a correlation between the relationships we have with customers and a higher likelihood to refer our product. And with video, it's easier to build those relationships at scale." Video is a tool to build relationships with customers and drive engagement, so we thought: What if we made a personalized video thumbnail for each individual customer? We bet that it would make our customers even more engaged with our offer, and our A/B tests confirmed the results: The generic, non-personalized thumbnail had a clickthrough rate (CTR) of 9.5% -- while the personalized one had a CTR of 14.6%. Following the principle of focus helped us build a customer marketing campaign of small personalized touches that grew into a matrix of hyper-targeted messaging, grabbing our customers' attention and making them happy to engage. 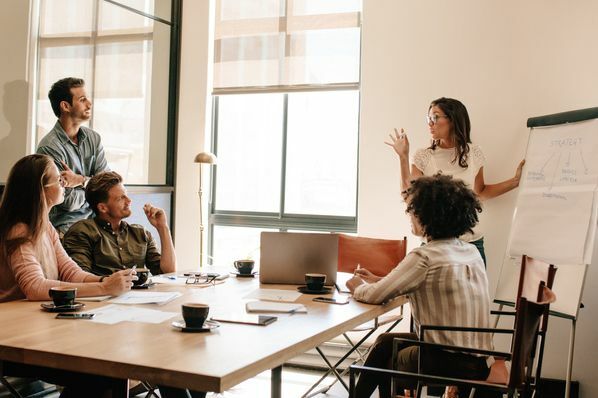 "Of all the things that can boost emotions, motivation and perceptions during a workday, the single most important thing is making progress in meaningful work," say experts Teresa M. Amabile and Steven J, Kramer, in their article, "The Power of Small Wins." Humans -- a.k.a. your customers -- care deeply about personal and professional progress. So much so that hitting milestones and accomplishing goals actually makes people happier. For our customer marketing campaign, we knew we needed to give our customers a clear vision of what progress they could make (i.e., what kind of marketer they could become) by moving to a bigger, better annual plan. The plan comparison table helped show customers all the extra benefits that came with the new plan; benefits like unlimited domains for their landing pages and overlays and the option to drive a lot more traffic than they could with their current plan. 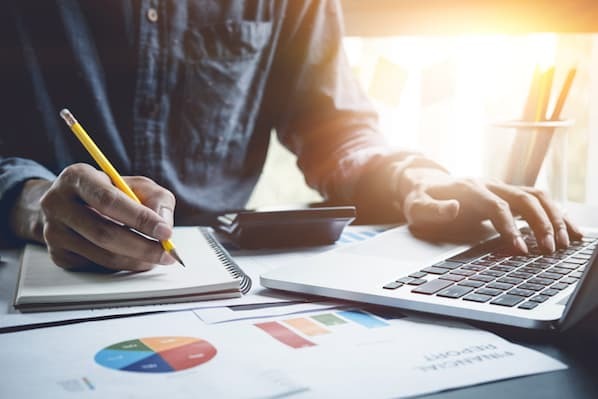 Ultimately, making progress an important principle of our customer marketing campaign helped ensure our customers had a clear vision of what new benefits and features the annual plan would unlock for them. Giving thanks goes a long way. And for Jennifer Moss, author of the HBR article, "Happiness Isn't the Absence of Negative Feelings," gratitude is a positive emotion that boosts happiness. But it's one thing to say thanks, it's another to show it. 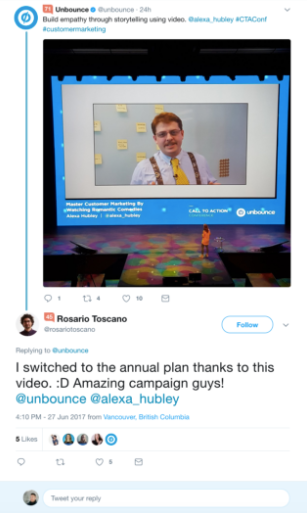 So during our customer marketing campaign, we also gave away 20 tickets to our annual Call to Action Conference (valued at $1,000 each), 100 deluxe Unbounce swag packs (valued at $30 each) and 10 exclusive 1:1 sessions with our in-house conversion optimization expert, Michael Aagaard (valued at $500 each). We wanted to go above and beyond to make our customers feel special, positive and appreciated. You can't put a price tag on customer happiness, right? Not explicitly called out by the Harvard Business Review's collection, but hinted at throughout, is the power of making someone smile through humor. And since it's our job as customer marketers to make our customers happy, infusing a campaign with a little bit of humor is an easy way to bring a smile to your customers' faces. But making something like a campaign to drive annual plan sign-ups "funny" is not the easiest task. Ultimately, we wanted to transform the customer marketing campaign into something enjoyable -- and a little bit funny -- that would make our customers smile. By the end of the six-month campaign, we had driven over $600,000 in annual recurring revenue for Unbounce and increased the number of customers on annual plans by 5X. The best part is knowing that we built a campaign that made our customers so happy, they shouted from the rooftops -- a.k.a. their laptops -- about it. And that's the goal of any customer success campaign, right? Dedication to customer happiness will help turn your customers into your biggest evangelists -- and their recommendations will grow your business faster than sales and marketing. What are your strategies for ensuring customer happiness? Join in the conversation with me on Twitter.